Police say the pedestrian was pronounced dead at the hospital. 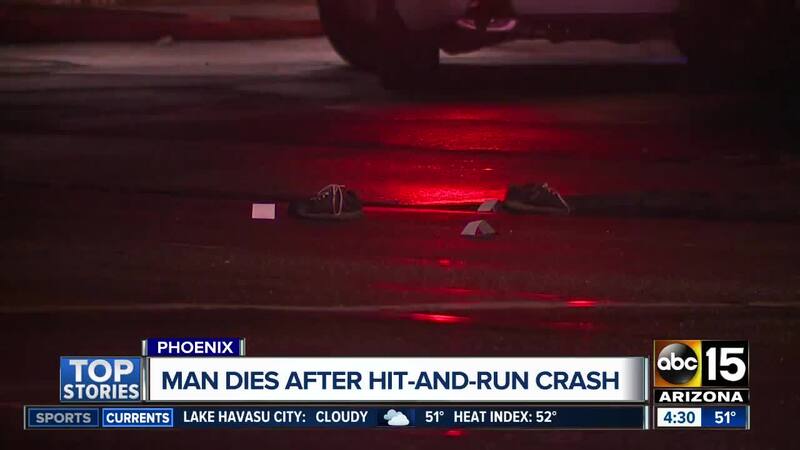 PHOENIX — Phoenix police are searching for the the driver who hit and killed a pedestrian late Tuesday night. Officials at the scene near 51st Avenue and Thomas Road told ABC15 the pedestrian was crossing the road from north to south when the crash occurred. The pedestrian, a 54-year-old man, was pronounced dead at the hospital. He was reportedly in a crosswalk when he was hit. Police say the vehicle that hit the pedestrian fled the scene after the crash, and they are now searching for it. It was initially described as a a dark-colored SUV. Anyone with information about the crash is asked to call Silent Witness at 480-WITNESS.